[dropcap size=big]T[/dropcap]here is a music blowing in the breeze in towns up and down the East Coast and into many towns across America. It’s called Trop Rock and its followers are ardent fans of the tunes about beaches, beautiful water, Tiki huts, lots of fun and leaving your troubles behind. The music can be heard on radio stations online, including A1A, Shore Life, Island Time, Permanent Vacation Radio, TikiPod Radio, The Surf, Tiki Man Radio, Beach Front Radio, Radio Trop Rock, Beach Bar Radio and Oyster Radio. The men and women who write, record and perform Trop Rock music are as addicted to it as are their fans. Many of them live in or near the beach and write about the life they live every day. The listeners, who may or may not live near a beach, certainly wish they could partake of that beach lifestyle they hear about in their songs. Clanton admits that when he moved back to Florida with his fiancé, he didn’t really know what he was going to do. “Phlockers Magazine” is a magazine devoted to Trop Rock music, the artists and their fans. The core fan base for Trop Rock are Parrot Heads (Jimmy Buffet fans). They love this music, so when they go to an event they Phlock (flock) to it, thus the name of the publication. The magazine joined in with A1A to start a chart, where fans vote for their favorite songs. Clanton has had 16 number ones on that chart. Once Clanton realized how cool Trop Rock was, he called his friend Dayglo Red and told him about the music. Now Dayglo , who goes by Dayglo Red when he performs and sings Trop Rock, is an artist on his way up in the Trop Rock genre. 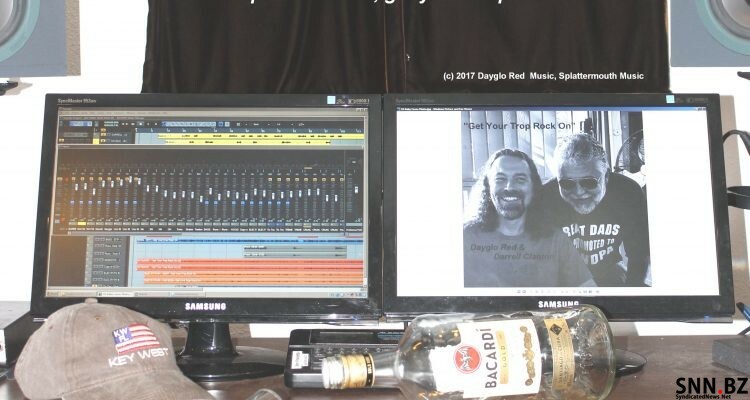 Dayglo had a hit song with Robin Tricker, another Trop Rock singer/songwriter who hails from New Jersey. She was the first woman to have a number one song in the Trop Rock genre. friend, Cory Young, moved to the Keys and persuaded Thurman to come down. Each of these singer/songwriters has albums out and plan new releases soon. You can find them on their Facebook pages and their music on internet sales outlets. of the Pit Stop Tour which leads up to the Meeting of the Minds event in the Keys. Radio A1A will broadcast live from the festival. lifestyle. The other day a guy said something to me on the beach and it became a song. One of the things Thurman would like to see happen within the Trop Rock genre is that it could expand. Thurman added that he is seeing more events featuring Trop Rock that are not close to the beach in areas near Branson and even Nashville. Registration for Meeting of the Minds is already past for 2018. The shows on the Tiki Town Pit Stop Tour are open to the public. Following is a list of those events. Several of them are two-day events. Oct 28, SWFL PHC’s 7th annual Pitstop Party, Dolphin Key Resort, Cape Coral, FL 11 a.m.
Octo 30, Pit Stop, Too at Boondocks, Ram Rod Key, 11 a.m.
Que Pasara con Los XV de Rubi?